Just wondering: What ever happened to calling a game from the bleachers? I distinctly remember as a wee lad, sitting in our basement on a bed of red and black shag carpet, surrounded by Transformers and He-Man action figures, watching Harry Caray and Steve Stone drunkenly call a game from the bleachers. The bleachers! The more you think about that, it is just classic. It's ballsy, spontaneous, fun, ill-advised and something you would only see at Wrigley Field. I suppose it was, in essence, 'vintage Harry', but what I wouldn't give to listen to Pat Hughes and Ron Santo call a game from the (Bud Light...eck) bleachers. Harry even upped the ante by doing it shirtless once. What a stalwart. What a stallion. 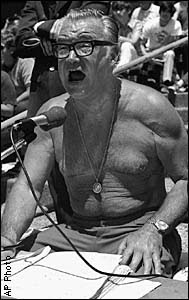 Let it be said, that if in this post-9/11 society that we live in, Bob Brenly and Len Kasper were to call a game from the bleachers (Brenly being the shirtless one, clearly), it would change the face of the game in a way unseen since Jackie Robinson. That may be an blatant exaggeration, but I will do anything to prove my point. America needs many things, but shirtless, drunken announcers is at the top of the list.